There is nothing more beautiful than Frederick County in December. Twinkling lights illuminate storefront windows throughout historic downtowns. Festively lit, towering trees line the streets, shedding light on the hustle and bustle of people moving about below. You can feel the holiday cheer in the air as horse-drawn carriages parade through Everedy Square. All of these touches create an enchanting ambiance, yet there is one even better reason to visit Frederick County during the holidays -- the food. The holiday season is usually perfect for hot chocolate and warm cookies, but this year’s unseasonably warm temperatures made it ideal t-shirt weather. What better way to celebrate the change from warm to cooler temperatures than with fresh-from-the-farm ice cream at Rocky Point Creamery! 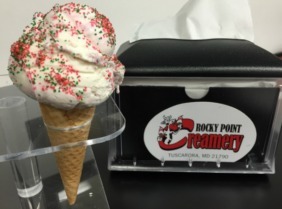 Rocky Point Creamery offers a variety of seasonal flavors including candy cane, peppermint bark, and sugar cookie (pictured), while supplies last. This is some of the creamiest ice cream out there and you can’t beat the gorgeous farm views from the shop. If it’s too cold to brave the outside temperatures but you’ve still got a craving for ice cream, just use the drive-through window and order from the warmth of your car. New to downtown Frederick this year, Glory Doughnuts is cooking up another sweet holiday treat: the peppermint doughnut. This cute little shop on East Church Street is truly one-of-a-kind, offering a full menu of vegan delights that appeal to even the biggest meat lovers. Eclectic everyday offerings on the all-day breakfast menu include the Pabst Blue Ribbon Belgian Waffle, Salted Apple Pie Stuffed French Toast, and the Tofu Fried Egg Sandwich. The doughnuts are made fresh daily in small batches and sell out early, so come early! The selection varies from day to day, so call ahead if you have your heart set on peppermint! Looking for something a little less sweet to celebrate the season? Brewer’s Alley, also in downtown Frederick, has you covered! In addition to some pretty delicious food, you will find two unique tasty beverages. 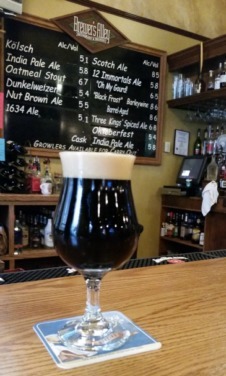 The 3 Kings Spiced Ale is a medium-bodied winter ale flavored with mulling spices and the Blackfrost Barleywine (pictured) is malty with a nice balance of hops. If you are wishing fall hadn’t passed so quickly, you can still enjoy Oh My Gourd, a beer flavored with cinnamon, clove, and ginger. These are just a few of the many seasonal treats Frederick County has to offer. I hope you’ll come and see for yourself! Melissa Joseph lives in downtown Frederick with her fiancé Tyler and their dog, Lucy. 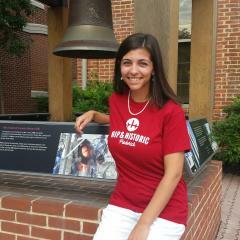 An active member of the Rotary Club of Carroll Creek, Melissa loves to help make the city of Frederick a great place to live, work, and play. She serves on the Board of Directors for both Habitat for Humanity and the Uptown Alliance. 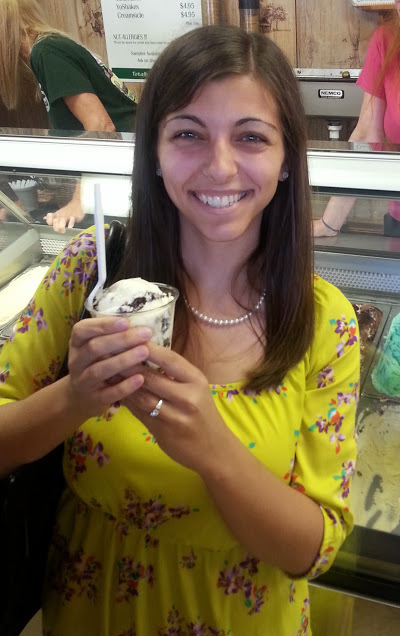 Melissa describes herself as unable to sit still for very long and she loves to travel.